phase~in is an electro-acoustic duo from Hamburg. 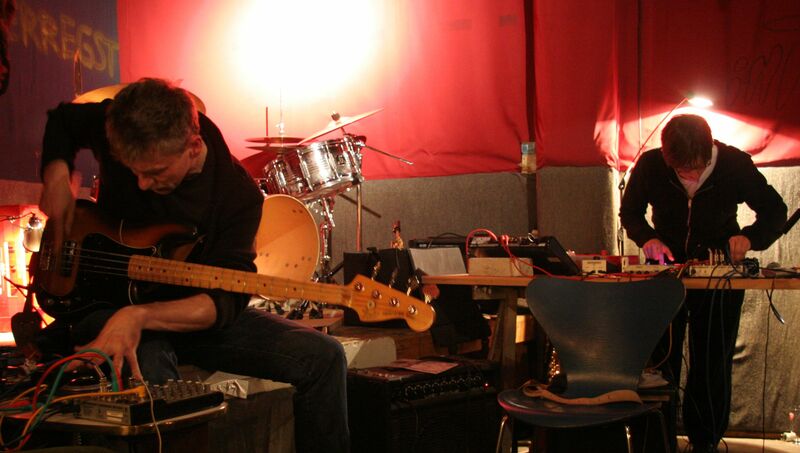 In a radio broadcast for improvised music in 2007 first tracks were live on air at Freies Sender Kombinat Hamburg (FSK), which resulted in a further cooperation between the two musicians developed. The tracks are created intuitively and improvised with a noisy aesthetics. The music of phase~ in is dynamic and moves between tiny micro sounds and sound explosions. Gunnar Lettow extends the sound of the electric bass by different preparations such as spears, clips, brushes and the use of effects units. He explores the sounds of the electric bass and creates new universes of sound. He has alos a duo with Korhan Erel and plays regularly in ad hoc formations (Ernesto Rodrigues, Herman Müntzing, Carl-Ludwig Hübsch, Nicolas Wiese, Ofer Bymel, etc.). He is the organizer of concert series for improvised music Frequenzgänge. Sylvia Necker works for quite some time on the links between various sound modules and effects units. This led to their instruments: the „space station“. This „space station“ with a hundred control buttons and several meters of cable isn’t only audible at phase~in, but also in solo performances. She can be heard in different formations, mainly as drummer and saxophonist. For more than ten years, she was the organizer of the concert series „Freitagsmusik “ for improvised music (http://www.freitagsmusik.de).